It seems as if BMW’s main competition is shifting a bit. The Bavarian brand’s main rival has always been its German neighbor, Mercedes-Benz. And while it still is, a newcomer is starting to target BMW almost as much as the Stuttgart giant. Tesla has been targeting BMWs with each new model, despite the Silicon Valley-based cars being entirely electric. According to Tesla, the Model S competes with the BMW 7 Series and Mercedes-Benz S-Class, though we’ve recently learned that’s not true. In fact, by nearly all metrics, the Tesla Model S competes more with the BMW 5 Series and Mercedes-Benz E-Class. The former has just been updated, as BMW has just recently launched its G30-generation 5 Series. So how do these two new rivals stack up, despite their powertrain differences. 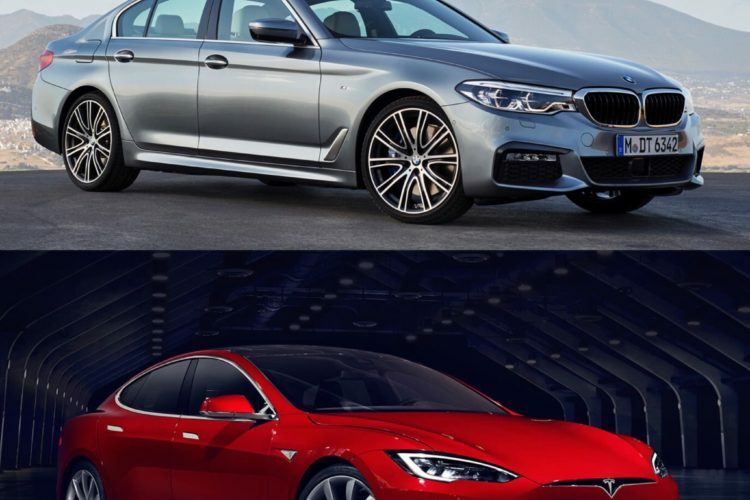 Both cars have various different specs and trim levels, so let’s compare the Goldilocks variants of both — the BMW 540i xDrive and Tesla Model S 75D. 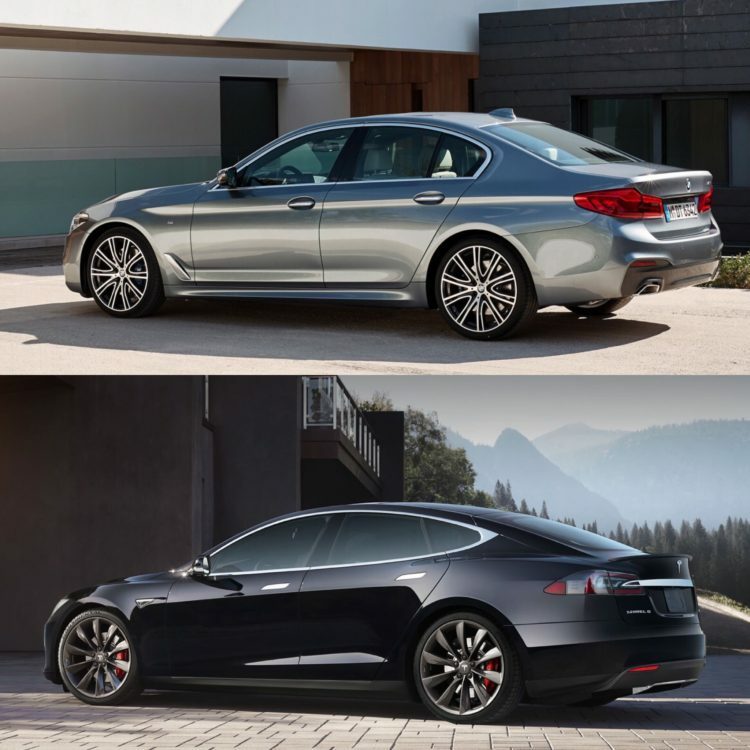 Both of these cars are around the same price (though the 540i would need quite a few options to match the Model S’ price), are about as fast as one another (the 540i is a touch quicker) and both come with the about same equipment levels. Yes, there are more powerful and faster Teslas, just like there are more powerful and faster 5 Series’. But these are the common models and the new M5 isn’t out yet, so we can’t compare the Model S P100D with it. In terms of looks, both are good looking cars. Personally, I do feel that the new 5 Series is the better looking car and it’s not because I’m a BMW fan. Ever since the Model S first debuted, its looks have lost their luster. It’s a handsome enough car, but it’s so nondescript that if it had “Toyota” badges, no one would question it. It’s just not an exciting or visually interesting car. The new 5 Series has nice lines and aggressive looks. It’s just the more visually engaging car. While some may not like the looks of the new 5er, I still think it’s the more handsome car, especially in profile. The Model S is just too slab-sided with very few defining characteristics. I’ve said it before and I’ll say it again, the shoulder line on the 5 Series that meets the front fender flare gives the side of the 5er such an aggressive look. It’s that sort of visual intrigue that the Model S lacks. However, if anyone owns a Model S, they won’t be disappointed by it’s looks because it is a handsome car. It’s just a touch boring. In terms of power and performance. The BMW 540i will pack a 3.0 liter turbocharged I6 engine that will develop 340 hp and 332 lb-ft of torque. Paired with an eight-speed automatic, the 540i will get from 0-60 mph in 4.8 seconds with xDrive all-wheel drive aiding in traction. That’s plenty quick, especially for such a big car. The Tesla 75D packs two electric motors, one at each axle, and a 75 kW battery. With its electric torque and all-wheel drive grip, it can shift from 0-60 mph in 5.2 seconds. So it’s a bit slower than the 540i xDrive, but only by a blink. In terms of their cabins, both are very nice and very luxurious. Though, both are very different. The BMW 540i, especially with the M Sport package (which is a must), looks very sporty and driver-oriented. The Model S, on the other hand, is very relaxing and far more technology-oriented. 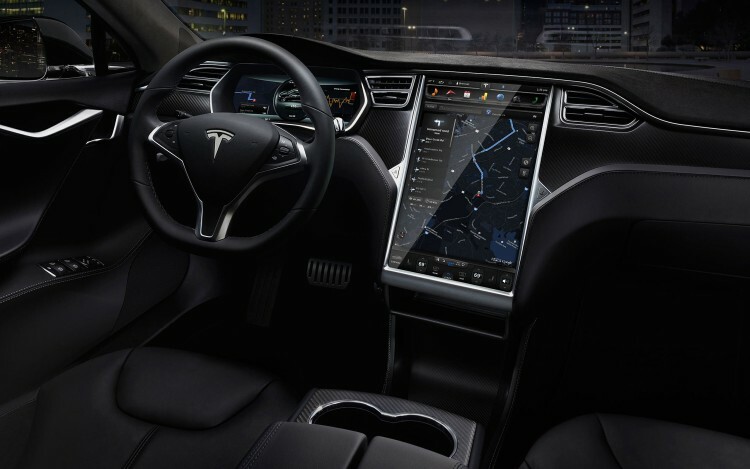 In the Tesla, the massive center-mounted touchscreen display dominates the cabin. 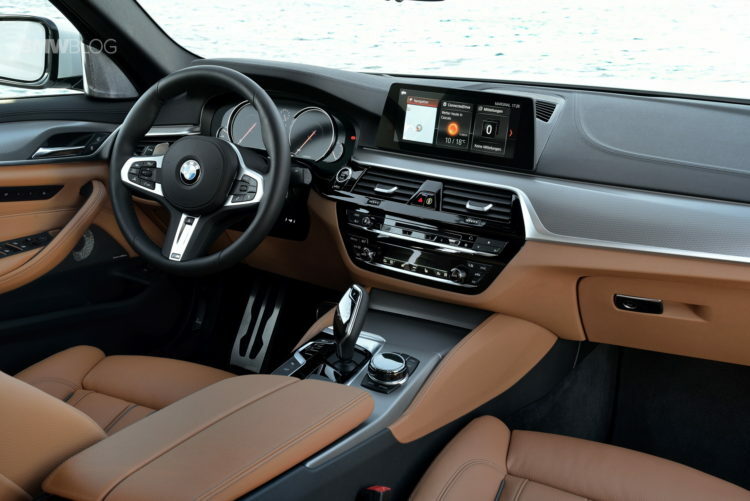 The iDrive system in the BMW is also touchscreen, as well as having both physical and hand-gesture controls, but is far smaller and more traditionally mounted on the dash. Though both cars have similar cabin amenities, typical of the class. Where things get very interesting is in both cars autonomous driving technologies. Whereas the Tesla Model S can be had with the brand’s Autopilot system that supposedly offers “Full Self-Driving Capability”, even though that’s not technically true, the BMW 540i can only be had with autonomous driving aids. The Model S with Autopilot can drive itself through most traffic situations, though it does require its driver to take over for certain circumstances. It’s very effective, but still in Beta phase. The BMW 5 Series has the ability to take over steering, on top of the typical automatic cruise control, for brief moments on the highway. It can also change lanes on its own and park itself, but it doesn’t have the same level of autonomy as the Tesla. Both cars are very good cars and both have impressive performance, luxury and technology. Though both have very clear cut goals that differ from each others’ greatly. The Tesla Model S is clearly the more technology and luxury oriented. It is focuses solely on offering the driver the easiest, quietest and more technological driving experience possible. Whereas the BMW 540i seems to be after offering the driver a luxurious driver’s car that’s equally as fun to drive as it is comfortable to relax in. 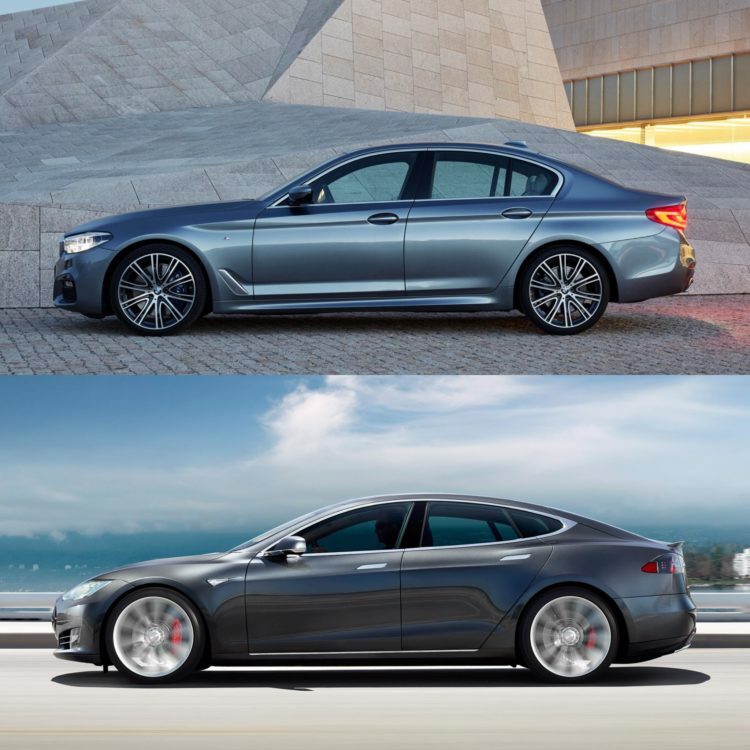 The BMW 540i seems to be the more well-rounded car, as it can be more cars than the Model S, as it can be both luxury car and sports car. But if it’s techno-luxury you’re after, the Model S seems like the more clear-cut choice. So which of these two cars would you choose?